Everyone knows The Beach Boys sang about it in their hit song “409” (“She’s real fine Ken’s 409”). But, few know that the theme song from the musical “The Beauty and the Beast” was really about the 409! In the early days of the Detroit horsepower wars the dual-quad 409 was in a league of its own. There was simply nothing else on the road that could touch its 425 horsepower. 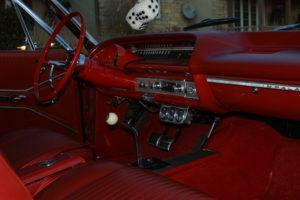 Under the hood of an Impala SS coupe it was the beast in the beauty. 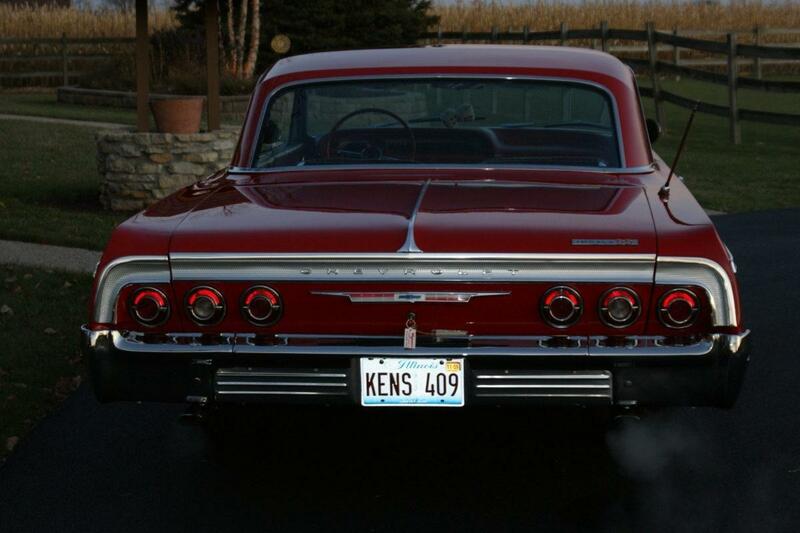 When Ken fires up the beast it sends him back to ’64 and his first 409. It just so happens ’64 was also the year he met his wife Carole! 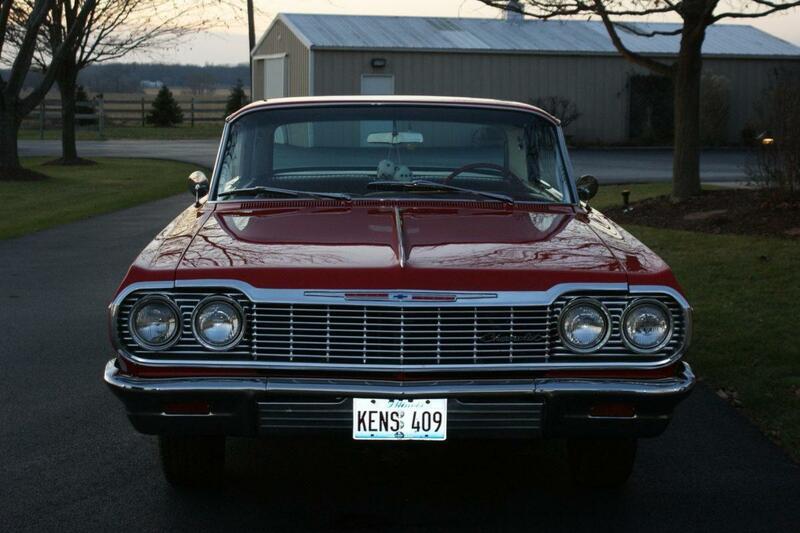 In the late ‘80’s, early ‘90’s a gentleman by the name of Bill Bonner from Camby, IN acquired an authentic 1964 Chevrolet SS 409 with the 425 HP engine and a 4-speed transmission. 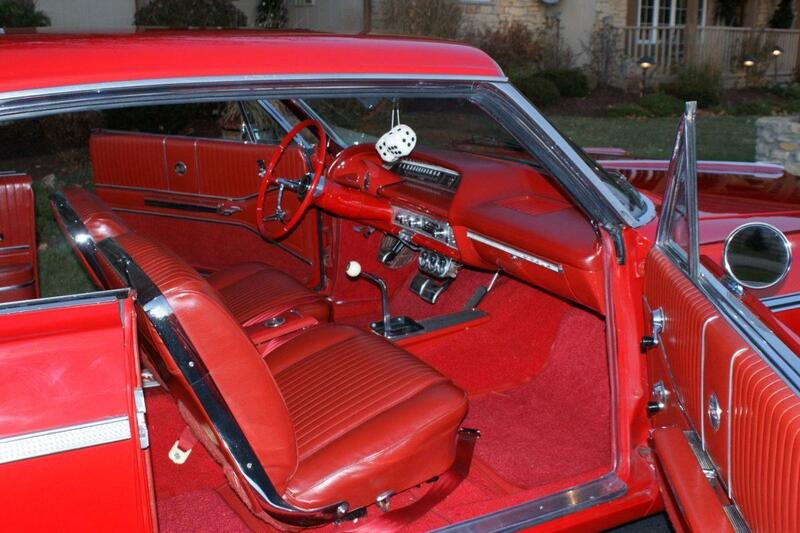 He subjected the 409 SS, finished in rare Ember Red with a Red interior, to a meticulous frame off restoration. The extensive documentation includes photos of even the smallest nut and bolt, lists of suppliers and sub-contractors in a 1” thick binder. 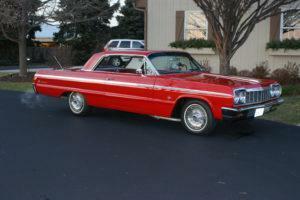 He had the car inspected, authenticated and appraised in great detail. The paint finish was so well done it looks new today. The car subsequently changed hands at least three times until it appeared at the Mecum auction in St. Charles, IL in 2003, at which time it was acquired by Ken Nagel. 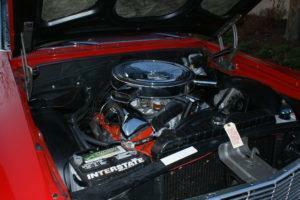 Ken had Bob Baker of Old Coach Works of Yorkville, IL refresh the engine bay and underside. 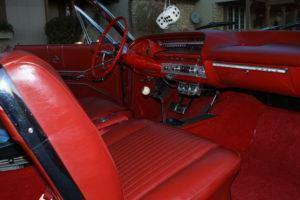 Bob Buss of Montgomery, IL refreshed the interior to showroom quality. 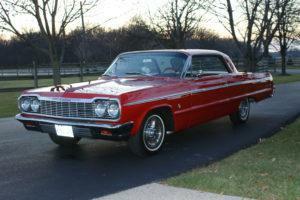 The car was recently featured in a display of ‘50’s, 60’s “muscle cars” at the prestigious Sloan Museum in Flint, MI. By 1964 the fabulous finned fifties had faded into the past. Detroit was slimming down, shortening up and rounding off its offerings. While styling was trending to the more subdued that was certainly not the case for engines. Horsepower was the name of the game in ‘64. Ford launched the Mustang with the HiPo K-Code engine and GT 350 to usher in the “Pony car” era and Pontiac crammed a 384 HP V8 into the Tempest to give birth to the GTO, but for unbeatable “Giddy Up” a full sized Impala SS with a 425 HP 409 cu in V8 was the way to go. The 409’s magical power was evident from the beginning. 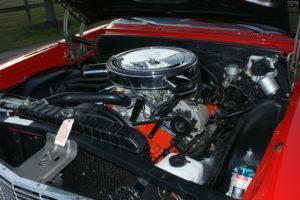 With twin 4 barrel carburetors, solid lifters and a special cam the 409 pumped out an unheard of 425 HP. The single 4 barrel 409 made 400 HP (340 with hydraulic lifters). While it is thought the majority of 409’s went into Impala Super Sports not all of the 185,325 convertible and hardtop SS’s had the 425 HP 409. You could tuck a 425-hp Turbo-Fire 409 V8 into any 1964 Chevrolet Biscayne, Bel Air or Impala. Stripped down Biscayne’s with souped up 409’s were the scourge of every drag strip. 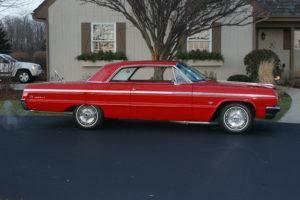 185,325 Impala SS’s went out the door in ’64, 81,897 rag tops and 103,213 2-door hardtops. 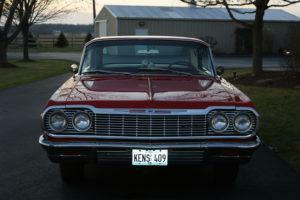 That same year Chevy cranked out 8,864 409 engines in three horsepower versions. 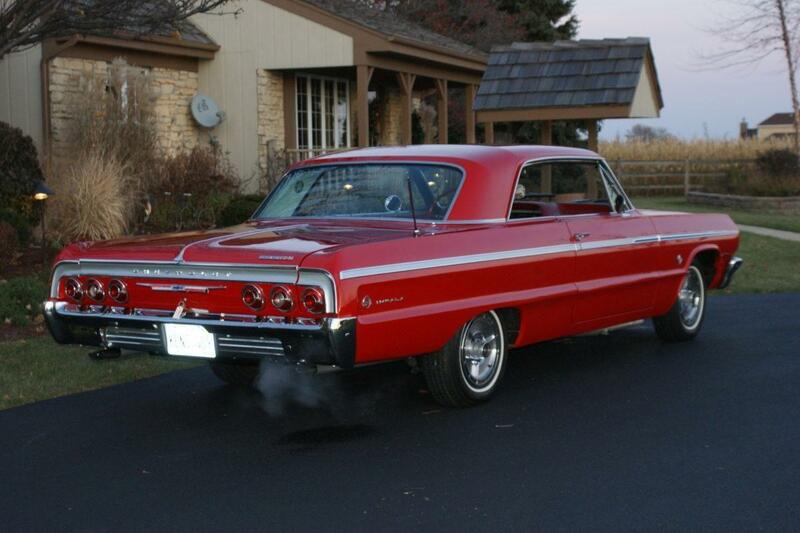 Because of Chevys record keeping, however, the exact number of Impala SS 2-door hardtops fitted with the 409 425 HP engine is not known for certain. A good guess would be somewhere around 1,600, give or take. Going further and assuming a high survival rate of 80% and assuming a high concours level restoration rate of 50% makes this car maybe 1 of less than 200-300 exceptional authentic 409 SS cars in existence. What is for certain however that is the exceptional, rare numbers matching and extensively documented example displayed in Ken’s collection is the real thing. A superbly restored rendering of the car the Beach Boys sang about. The very desirable Ember Red finish is flawless and coupled with a matching red interior makes this SS sparkle from every angle. Rare factory options installed at the Arlington, TX assembly plant only serve to enhance its collectability; padded dash, window washers, SS hub caps, factory tach and the newly offered tilt steering wheel option. The precise and sturdy Muncie “Rock Crusher” 4-speed transmission with Hurst shifter connects to a 4:11 positraction rear end making sure all 425 ponies get to where the rubber meets the road. Beautifully sounding Flowmaster dual exhausts lets everyone know what is lurking under the hood. Songs have been sung about this American icon and records have been set by its unbelievable performance. With out a doubt, this is certainly one of the most sought after ’60 era Chevys. 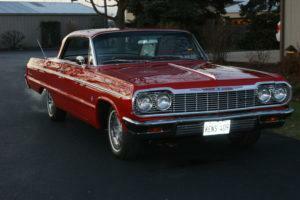 The Chevrolet Impala is often credited with helping start the muscle car era. The sensational performance came from the 425 horsepower 409 fitted with twin 4 barrel carburetors. Strength came from impact-extruded pistons and forged steel connecting rods with a five-main bearing crankshaft. A special cast alloy iron camshaft was utilized and the high compression 11.00:1 heads were fitted with lightweight valves. Mechanical valve lifters, dual exhausts, special clutch and heavy duty radiator added up to power, strength and durability. Chevrolet engineers didn’t just give the Impala SS more power; they also included important items like stiffer suspension, power steering and heavy duty power brakes. Superior rear axle location with four, rather than three, links made it one of the best handling muscle cars of its day. Cultural icon or stylish and fast cruiser, the Impala SS 409 is a lot of car. The ‘50s were over, and the cars of the early ‘60s were restrained in their use of chrome and trim. 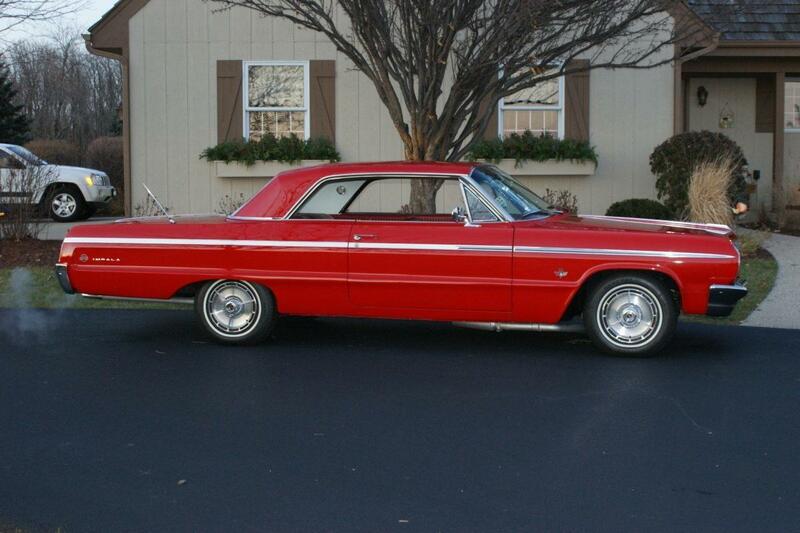 The slightly restyled Impala Super Sport with a more rounded, softer look became its own series in 1964. The SS badge was to become Chevrolet’s signature for performance though it often was an appearance package only. The SS was the most luxurious and sporty model and only available as a two door convertible or coupe. The SS trim on the Impala featured distinctive body side moldings in a special engine-turned aluminum strip that ran the length of the body. The grille is simple, framing quad headlights in a no-nonsense kind of way. The signature taillight assembly had an “upside-down U” shaped aluminum trim strip above the taillights, but the lights themselves were surrounded by a body-colored panel. The list of standard equipment on the SS included leather grained vinyl upholstery with individual front bucket seats, swirl pattern dashboard and body molding inserts. 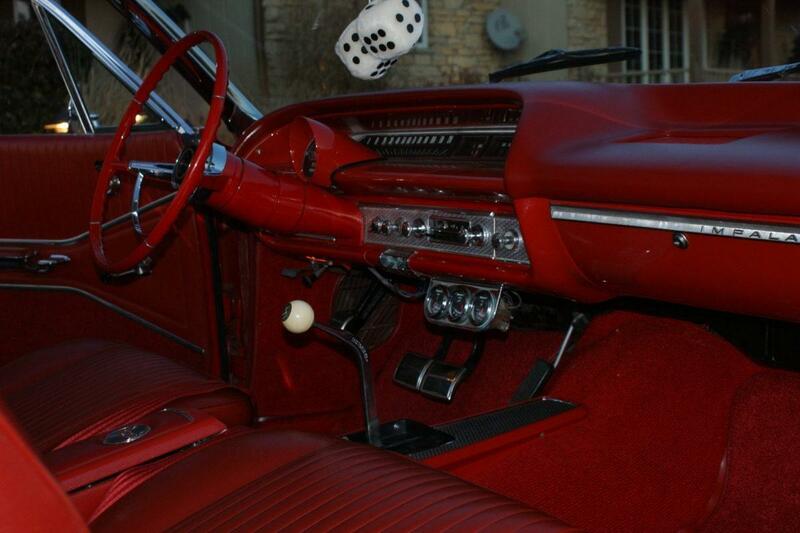 There was also a locking center console, a built-in rear seat radio speaker grille, dual dome and floor courtesy lamps with automatic door switches, full wheel covers of specific Super Sport design and red SS emblems all over the car including the engine-turned aluminum emblem on the steering wheel. 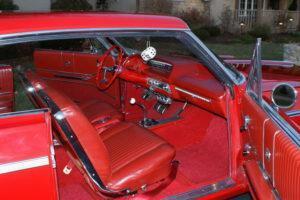 Additional standard equipment included thick foam cushion seats, bright aluminum front seat end panels. 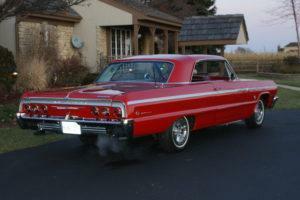 The Impala SS was pure ‘60s elegance with an attractive sporty look that would blow the doors off anything on the road.